Have a lot of scarves, ties, or other dorm accessories that you need organized? Looking for a dorm storage solution that will make sense of all those dorm accessories and keep you more organized? You've come to the right place! Add our 2 Pack Flocked Scarf Hanger to your dorm essentials and you will be so glad to have extra dorm organization for your college closet! This dorm essentials pack comes with two dorm hangers so you maximize the amount of dorm room storage space you have. While they add more dorm room storage space, they don't use up a lot of space, which makes this a dorm space saver and is a super important feature in your college supplies. Our 2 Pack Flocked Scarf Hanger comes with two oval shaped black dorm hangers. Each closet organizer in this pack has 14 loops for your scarves, ties, hand towels and any other dorm accessory that needs a home in your college dorm room. That means you can hold a whole bunch of dorm essentials without worrying about running out of dorm room space in your dorm closet. 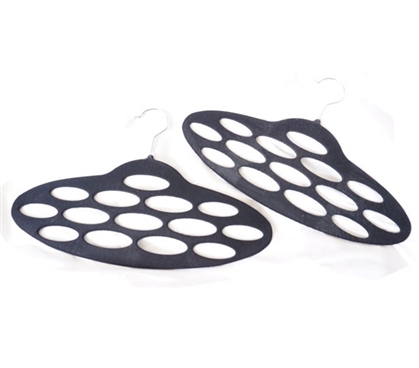 These dorm hangers have a lightweight, compact construction that uses minimal space and also won't damage your delicate dorm items on the smooth plastic. Keep your fragile scarves and other dorm necessities from falling into a heap on your dorm closet floor and becoming wrinkled with our 2 Pack Flocked Scarf Hangers!